Palestinian State - Figment of Imagination? The idea of a two-state solution has been doing the rounds for many years to achieve a peace settlement between Israelis and Palestinians. Most countries in the world including the US, EU have expressed support for a two-state solution. A solution to the Israeli Occupation since the Six Day War of June 1967 has been discussed in international forums for many years, including negotiations with the Palestinians. 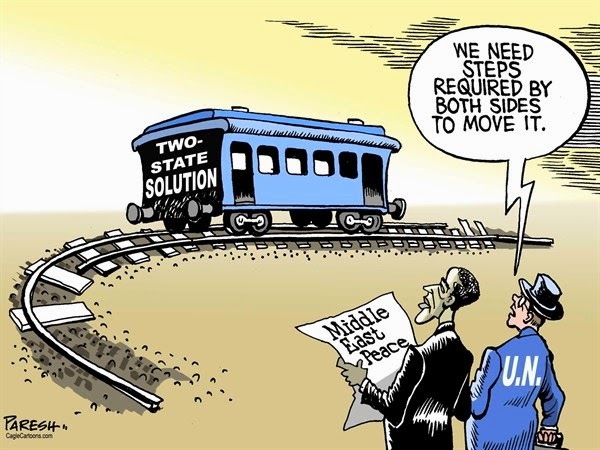 There has been no progress towards a two-state solution. While we all want a solution to the Israeli-Palestinian Conflict, there is no sign that this is going to happen any time soon. The reasons are numerous and complicated. It is not because PM Netanyahu said that under his watch, there will be no establishment of Palestinian State. There is no situation on the ground that is conducive to negotiations. Mahmoud Abbas and his chief professional negotiator for peace, Dr. Saeb Erakat represent nobody but themselves. According to the latest polls, Hamas support in the West Bank is on the increase and support for the PLO- oriented PA (Palestinian Authority) is on the wane. Even if a peace agreement between Israel and the PA is reached, Abbas will never sign because Hamas will never accept it. Hamas will only accept a "Peace Treaty" that delegitimizes Israel's right to exist. Israel’s establishment of settlements in the occupied West Bank is not an issue. As far as Hamas is concerned, Israel is occupied territory since 1948 and this is their mantra that is well outlined in the Hamas Charter which has not changed. The PA has had no general elections since 2006. It has no democratic institutions and no accountability to its people. Transparency in government is non-existent. They know that Hamas is breathing down their necks waiting to take over the West Bank if elections would take place. The result for Israel would be disastrous! The PA and Hamas have signed an agreement even though it is shaky. There is total instability in the Middle East with warring factions ranging from ISIS, Jabhat al-Nusra, the genocide of the Yazidis and Christians. Hezbollah, who are allies of Hamas, Salifis and many other Islamist terror groups are engaged in partisan terrorist activity. With all due respects, how on earth can one see a fertile ground for a two-state solution? One must also bear in mind that all these groups have an insatiable, pathological hate for Israel. These terrorist nationalist groups are hell bent on Israel's destruction. The UN is impotent and many of its members spend time on bashing Israel on "human rights abuse" concerning the Palestinians. The chaos in Syria, Iraq, Yemen and Lebanon is hardly an issue. Iran and Turkey are also involved. The former is supporting Hezbollah and Syria’s butcher, Bashar el Assad, while the latter sits on the fence. The occupation and building settlements are opposed by many of us, however, we realize that the alternative is worse. If Israel relinquishes the occupied territories, it will be filled by Hamas and the West Bank will deteriorate into a second Gaza and Hamas terror, tunnel digging for the infiltration of Hamas terrorists into Israel will increase. This will be the alternative to the occupation. It is a reality and not an ideology. Ideology against the occupation and the reality of a barbaric scenario without the occupation is obvious. This is the choice we really have. Sorry for this pessimism! If only this was not the case. The biggest enemy of the Palestinian Leadership (Hamas and the PA) is the strong belief in their fantasy world of glory. They create a reality based on their fantasies. In this attempt, they have much in common with ISIS and their terrorist ilk, despite their constant denials. The earthquake disaster in Nepal has overshadowed most news items in Israel. Israel has bent over backwards to send IDF rescue teams to save as many Nepalese victims as possible. Field hospitals have been established and many lives have been saved. Rescue teams have arrived from all over the world, each doing what they can to alleviate the suffering and working round the clock. There are groups of journalists in Israel of the likes of Gideon Levy who feel that Israel should be rehabilitating Gaza and not be putting in such effort to save lives in Nepal. He is wrong for many reasons (some of which will be outlined later in this article) and there are many double-standard, self-styled human rights activists who feel the same way. The Gaza War - Operation Protective Edge - broke out in July 2014 and lasted 50 days. Of course, the Palestinians in Gaza underwent traumatic suffering no matter how one views it. Large densely populated areas in Gaza were destroyed, leaving many people homeless. This was not the result of a natural disaster but Israel's military reaction to Hamas aggression, which Gideon Levy and his colleagues of like mind, ignore. The attempts at firing missiles into Israel by Hamas terrorist militants as well as digging tunnels to carry out murderous acts of terror created a situation whereby the IDF was forced to act in order to defend Israel's citizens. Hamas was warned but they took no heed. The result for the Palestinian population was tragic. It was grist for the mill of human rights activists sympathetic to the Hamas-oriented Palestinian cause and all that it entails. The Hamas use of innocent Palestinians as human shields is well documented with Hamas rockets being fired from UNRWA property and from civilian areas added to the tragic death rate of many innocent Palestinians. One must also note that the Hamas leadership was hidden in shelters underground and not a squeak was heard from them while Palestinian human shields surrounded their “hidey holes” and took a battering. The "brave-fearless-in-rhetoric" Khaled Mashaal sitting on the gold pots in Qatar, Ismail Haniyeh as well as many other Hamas leaders in an underground shelter were conspicuous by their absence. They came out of their holes when a cease-fire was declared to sprout their rhetoric of bravado and fantasy victory. Nepal is not Gaza and the latter's leadership is hostile to Israel. They would not have allowed the IDF to go on a lifesaving mission to help those Palestinians caught up in the tragedy. This would be against their interests of portraying Palestinian suffering at the hands of the “cruel occupier - Israel”! There were cases where Palestinians did arrive in Israeli hospitals for medical treatment. How can one expect Israel to rehabilitate Gaza when Hamas was responsible for the tragedy as well as declaring war on Israel and not a natural disaster? Hamas was the cause of Palestinian suffering and destruction! The "peace loving" NGOs and their journalistic ilk avoided publishing the truth. Truth in Hamas eyes is based on fantasy in most cases as well as dishonest reporting. After Operation Protective Shield, a ceasefire was declared and the destruction to Gaza was horrendous and the toll in death and destruction in Gaza was high. The blame for this must be laid at the doorstep of Hamas, who acted irresponsibility, crippled by their fantasies of victory, glory and irreconcilable hate for Israel that goaded them on to create a disaster for the Palestinians. Today acts of terror against Israel still occur. Individual Palestinians go on the rampage periodically ramming their vehicles into innocent bystanders or stabbing people in the streets. These terrorists are imbued with an irreconcilable hatred for Jews and carry out individual terrorist acts. The reality as portrayed in this article is not conducive to a Two State solution. It is a sad truth. It will remain a figment of the imagination to those, who are naive and ignorant to the reality on the ground in a sea of enemies surrounding Israel and the chaos in the Middle East of today. Unfortunately your argument is unacceptable. You assume that president Abbas does not represent Palestinian people and Hamas will win any new elections. Up to this point, no group including Hamas said that president Abbas is Illegitimate and he can not negotiate in the name of Palestinian people. They don't beleive in his techniques and strategies as it did not made any progress since 1993. Your argument that Hamas will make West Bank like Gaza in fill it with tunnels also unrealistic. First of all, your experience has shown that both Hizbullah and Hamas respect all agreements they make even much better that PLO and the PA. Second, you know there is big difference in land topography and soil that makes it impossible to dig tunnels. Third, if there is an agreement for ending occupation and razing of settelments, I'm quite sure that there will be no support for any group; Fatah, Hamas or Jihad to continue with fighting. People wants to live in peace and build good economy. I hope you as Israeli thinkers and intellectuals will stop feeding the Israeli people with these arguments and forcing them to move to the extreme right. I beleive Israelis want to live in peace but with this type of philisophy they will never go anywhere and we can not predict the future of this area. I think you are missing a great oppotunaty for peace by convincing yourselves with these arguments. According to the latest Palestinian Polls, you may be right about Hamas support decreasing, but this does not really mean that support for a Two-State Solution is increasing. I enclose a link of the latest Palestinian Polls. I do support a Two-State solution but on both sides there is no vision or desire to get back to negotiations apart from accusations against each other. I do wish to see dismantling of settlements in order to achieve peace but in the present situation I just do not see any side making concessions to get there. I do feel that the Hamas-PA agreement, as it stands does not increase any chances of progress, mostly because of Hamas extreme attitude towards Israel's existence. Unfortunately, Mr. Klein is undoubtedly correct when he states that a two-state solution is unlikely to occur in the near future. Some of his comments are accurate - the sectarian wars (Sunni v. Shia; Sunni v. Sunni) are leaving the region in chaos. And chaos is not conducive to settling long term grievances. However, Mr. Klein's one-dimensional analysis is symptomatic of a key impediment to finding a solution, namely, since the 1970's, most Israeli governments have been hostile to a two-state solution. Yizhak Rabin finally understood that peace had to be made with the Palestinians, but was assassinated by an Israeli settler. Ehud Barak almost got it right at Camp David, but thought he could force an unattractive deal down Yassir Arafat's throat. Unfortunately, for whatever reason, he could not bring himself to offer what the Palestinians had made clear was a non-negotiable condition - the land area of Palestine could not be reduced from the land area of the West Bank pre-June 1967. We should also note that, by the time he arrived at Camp David, he no longer had the support of his government for the negotiations. Ehud Olmert almost got it right as well. Unfortunately, he did not remain in office long enough to complete his negotiations, and was replaced by Netanyahu, who has never been interested in a two-state solution. 1. The chaos of the region does not excuse Israel's inexcusable land-grab in the West Bank. If Israel were truly interested in peace, the settlers would have been curtailed decades ago. To the contrary, the settlers' cause has had full sympathy of most Israeli governments which were more eager to expandIsrael's borders than to find a peaceful resolution to the conflict. 2. Mr. Klein claims that Operation Protective Edge was in response to Hamas aggression. This is simply untrue. A review of Shabakh's reports from December 2012 (following the truce ending Operation Pillar of Smoke) shows that the Israeli intelligence service considered the Gaza border to be quiet. In fact, Hamas fired no missiles against Israeli until Israel declared war against Hamas on the West Bank and assassinated two leaders in Gaza. By this time, Israeli defense forces were already at the border with Gaza. 3. Studying Israeli diplomacy, one could easily conclude that Hamas is correct in its view that Israel will not make peace unless forced to by armed struggle. The Palestine Authority recognized Israel's right to exist. Israel has never recognized Palestine's right to exist. Does anyone think that Hamas has failed to take notice? Israel occupied southern Lebanon for 20 years and only left when forced to by Hezbollah. Anwar Sadat offered a full peace with Israel in exchange for the Sinai in 1971 and in early 1973. Israel turned down his offer. There is a transcript of an Israeli security meeting in the spring of 1973, led by Golda Meir, where one of the participants pointed out that the decision to reject Sadat's offer would force Sadat to go to war. The conclusion was that the war would be better than giving up the Sinai. So Mr. Klein has reached a correct conclusion with faulty analysis. Some big questions remain, however, for those of us who used to believe in the old Zionist dream of Israel. For how long can Israel maintain its brutal occupation over Palestinians, without becoming brutalized? For how long can Israel adopt the settler mentality that dehumanizes Palestinians, before becoming a militarized, ultra-nationalist state, supported by a romantic, chauvinist, religious mythology? The crux of the problem originated not on 1967 but well before that. 1948 and 1967 were purely a fulfillment of words and deeds dating back to various riots and pogroms against Jews that occurred before the state of Israel is declared. It is simply simplistic to use Nassers admonition that the "Jews better learn how to swim" and Jordans unprovoked attack to claim "inhuman and brutal occupation". The question must be asked - How long will Israel tolerate murder and rockets by Hamas before it takes concrete actions. How long will the world tolerate that.